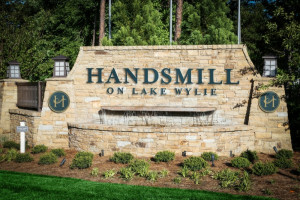 Water and nature are the driving forces behind Handsmill on Lake Wylie. No matter how hectic your day or the amount of traffic in your commute, coming home should be the most calming part of your day. Add to it living lakeside in beautiful Handsmill, and your day just got a lot better! 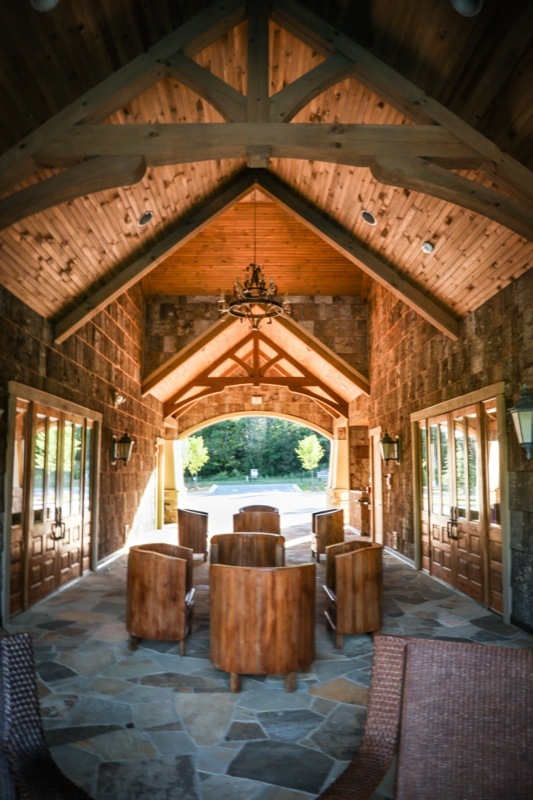 An outdoor meeting area in a rustic lodge setting. Handsmill is located on Hands Mill Highway and Highway 49. The community is 15 miles from I-485 and easily accessible to medical facilities, great shopping, dining and Charlotte Douglas airport, which is about 30 minutes away. Nearby recreation destinations include the U.S. National Whitewater Center, Daniel Stow Botanical Garden, McDowell Nature Preserve and historic downtown Belmont. The nearly 400-acre master-planned community is located in York County on Lake Wylie’s western shore. When completed, it will have approximately 500 homes, as well as plenty of green space and walking trails. Amenities, some of which are not yet completed, will include two marinas with 60 boat slips, boat launch ramp and boat storage area; common areas and parks; junior Olympic pool; fitness center; gathering rooms with fireplaces; catering kitchen; outdoor fireplace; and children’s playground. The community is being built in 7 phases and has separate sub-neighborhoods – The Manors, The Abbey and The Pinnacle – that include single-family homes and duplex homees built by Handsmill’s approved team of builders. 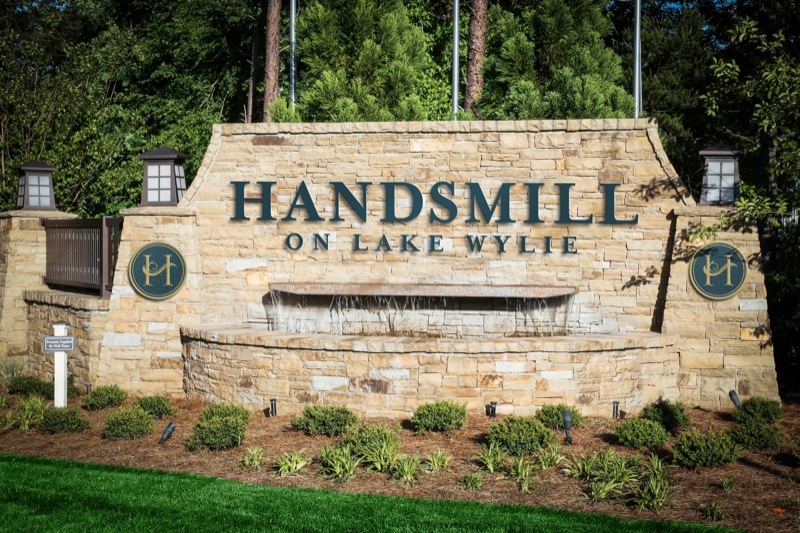 Nearest the gated entrance, the Pinnacle at Handsmill is being built by Lennar Homes. It offers single-family homes on smaller, interior lots. The Abbey is all about lakeside living! The custom homes and wooded home sites are nearest the water. Many of the home sites have dockable waterfront lots. There is a list of lots currently available in The Abbey. They range in size from just under 0.4 of an acre to almost 1 acre. Some are interior, but there are some dockable waterfront lots available. Homes in Handsmill are priced from the $440,000s and waterfront lots start in the $300,000s. 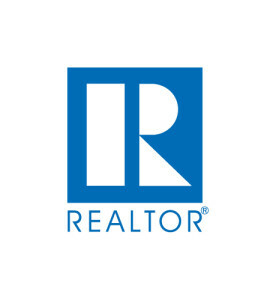 Homes currently listed for sale range from $478,350 for a nearly 4,200-square-foot, 5-bedroom home to $564,900 for a 5,800-square-foot, 6-bedroom home. None listed is waterfront. There are 7 new construction homes listed in MLS for sale. Only 1 is under contract as of March 23. There are also homes listed on the Handsmill site that are available and not listed in MLS. A list of neighborhood architectural guidelines are available on the neighborhood’s web site. According to the information provided on the Handsmill site, homes range in size from mid-2,000s to nearly 6,000 square feet. No information was provided regarding future phases in the neighborhood. Handsmill is zoned for the Clover, S.C., school system, including Bethel Elementary, Oakridge Middle School and Clover High School.